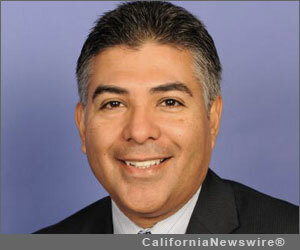 SAN FERNANDO, Calif. /California Newswire/ — U.S. Rep. Tony Cárdenas (D-San Fernando Valley) participated in the National Association of Manufacturers Congressional Dialogue series Monday, speaking at a local manufacturer, the Bobrick Corporation, a washroom equipment company. The Congressional Dialogue is an on-going, nationwide series of small group meetings with executives from companies who are members of the National Association of Manufacturers. The Dialogue sessions are normally conducted in a local facility. Monday’s event took place at the Bobrick headquarters in North Hollywood. Representatives from Bobrick were joined by Moore Industries, Casavan Consulting, the Valley Industry and Commerce Association, Canyon Plastics, Inc., Molding Corporation of America, High Point Strategies, Medical Illumination, Wilsonart, the City of Los Angeles, Boeing, APT Metal Fabricators, Metal Center and Excell Engineering. Rep. Cárdenas has made it a priority to discuss the state of manufacturing and policy concerns with businesses in the San Fernando Valley.